You should definitely watch that tutorial before you try this one unless you are very experienced using HTML and CSS. The theme is available in this zipped archive. This is a newer version of this theme. Everything is available under the GNU License. Here are all of the files needed for a WordPress theme. Click on the link to see that code. a ctually i’m watching your php tutorials. all amazing like this one. your last title Every Article helped to better navigate in your wevsite so now now i spend more time on it. First off all i realy like your vieo tuturials a lot. Im building my own wordpress time right now whit the help of this Tuturials. But im stuck a little. To show my post i used your code. But actualy i want to show all post except the post from the catagory Video. Can you plz help me out, i cant find how to change the code to let it work. Here is your answer! If you want to Exclude Posts Belonging to Category prefixing its id with a ‘-‘ (minus) sign. This code realy solved the problem thank you verry much. I know, i’ve almost seen them all. But maby there is one little issue you can help me with. When i come on my single page of a post and i have a image in that post. How do i delete the link on the image from the content. I don’t want that poeple be linkt to the original image. I hope you understand what i mean, because my englisch is not to good because im dutch. If I’m understanding, you would just have to delete the anchor tags that would surround the image. Does that answer the question? For getting the article information, how would the php code be if I am trying to pull the latest posts not specified by the categories? What I am refering is the lines 10 – 22 of index.php. Let’s say I am trying to get the recent 8 posts (in two columns (2×4) regardless of their categories and I have more than 2 categories, how would the code be like? I’m not sure whats it is wanting.. I tried writing my own it didn’t work so I copied and paste yours and it still is saying that. It’s looking for the style.css file. It has to be in your theme folder inside of wp-content. I found out what it was my permissions were turned off. Thank you for your help.. I’m just starting coding and all your videos are a big help.. I watch a lot of other ones and your by far the easiest and best for the help..
Once I get up and running I would like to make an ad for your Website on all my sites. So now that I have it to be able to preview or activate, when I click on preview it comes up as a blank screen nothing but white. is there any way that I could send you my CSS coding.. My dumb menu wont change, to what it should look like. I’m sorry, but I can’t correct large blocks of code. I just don’t have time to do that as well as continue to make tutorials. I understand that, I’ve been looking at your source code, and mine to see where my mess up is. I have this code right after the HorcontentRule just like you did in the Index.php folder. I did discard the at the beginning and end of the code. but I can’t get my text to show up. I copy and pasted your code and it still didn’t work, what could be the issue. Do you have excerpts in your posts? Yes, I do its about 93 words in the excerpt. When I put in ?php the_content();? it brings all the content but when I put in ?php $the_content = $post->post_content; echo substr($the_content, 0, 200); ? nothing comes up… I just want like part of it to come not all of it and not none of it.. anything you can think of? One thing I thought I should say to help is that it works for my Title. the code for my excerpt isn’t working in my sidebar either and all the Articles on my sidebar have over 200 words. Great tutorial. I have two questions..
My drop down menu items work fine in firefox/safari but do not work in IE.. is there a fix somewhere i can use? Also, is there anyway to set the drop down items side to side rather then on top of each other? You are really a brilliant teacher.. the way you taught is really easy to understand, thanks for such helpful tutorials, I request you to add some more tutorials about wordpress designing and coding..
Its wonderful tutorial. So how can we make the theme responsive? Any details on that? great explanations. everything is big and clear. you even interact with the viewer, calming him down. all the best to you and thank you very much! I’ve downloaded the theme and activated it. an error is showing on the top of my dashboard: “Notice: automatic_feed_links is deprecated since version 3.0! Use add_theme_support( ‘automatic-feed-links’ ) instead”. there is another error showing on my site: “Notice: wp_deregister_script was called incorrectly. Scripts and styles should not be registered or enqueued until the wp_enqueue_scripts, admin_enqueue_scripts, or init hooks. Please see Debugging in WordPress for more information. (This message was added in version 3.3.)”. the first error is gone, thank you! Where can i find the blank theme? What is the best tutorial about the responsive website using wordpress? You’re very welcome 🙂 What exactly are you trying to do in regards to a responsive website? The problem is that only one box each for the articles and the videos show up and there appear to be in the first sidebar. They also don’t have anything in them, just the title and container. Do I need to do something with the dashboard to make this work? I’m very new to WP; where do the article and videos come from? P.S. I really like you edited style; I like not having to listen to someone umming and ahhing. Hi Derek, I’m really enjoying your tutorials; thanks a lot for putting them up. I’m having trouble getting the middle container to work (the Articles and the Videos.) I thought at first it was my coding but I used your NTT-Cindy-Theme straight from the zipped file on your website and got the same problem. I’ve managed to work out that I didn’t have any articles or video; or the categories for them (told you I was new to WP.) I figured this out watching the next video. I’m still having trouble with the menu system, it’s just showing up as a normal list with bullet points. Hi.. I have downloaded the correct one from digwp.com. Please ignore my question about it please. Can i change colors in wordpress my sefl theme? 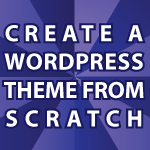 Yes you can do anything in WP that you can do with any other website. Thank you 🙂 I’m glad you are enjoying it. hi there! im in LOVE with your tuts!!! very clear and presented in a way that my brain just gets! THANK YOU!!! However, I was wondering where the “blank theme” is for download? I’m not seeing it aywhere? Thank you very much 🙂 The blank theme is available on this page. Thanks so much! youre amazing!! !